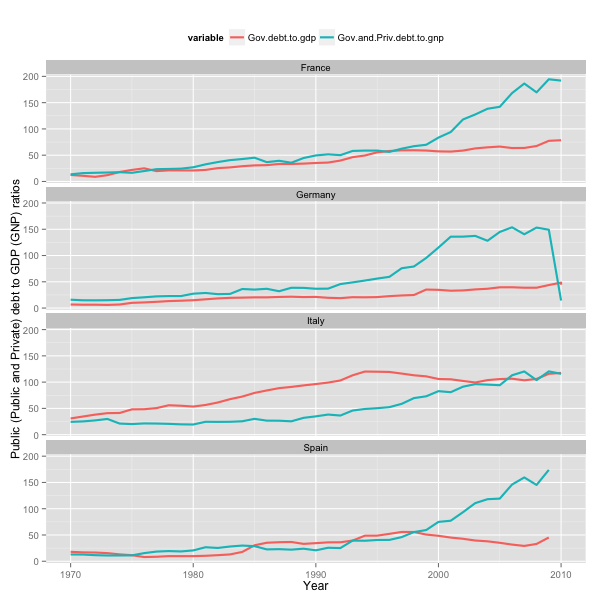 Update 2: Put up a second graph showing debt of Spain. 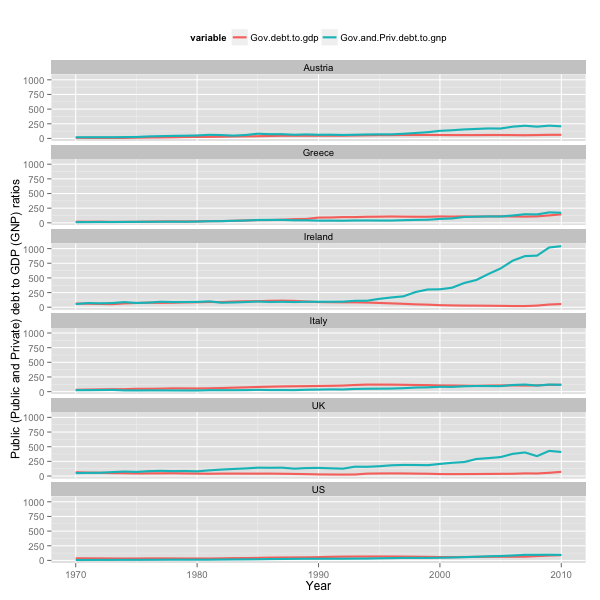 Spain and Ireland had fiscal surpluses and low debt/GDP ratios before the crisis. I updated the graph below with the Reinhardt and Rogoff data, now including Ireland. Not exactly a low debt to GDP ratio. I’m pretty positive that one cannot ignore this amount of debt, whether it’s held by private or government. This data comes from “This Time is Different” by Carmen Reinhart and Kenneth Rogoff. “Eight Centuries of Financial Folly” is the subtitle. It’s the first complete (over time) piece of empirical work on the full spectrum of “financial crisis”. UPDATE: As a special courtesy, here’s the data for this graph in a google spreadsheet. of course you’ll have to change the code to read that in with R. Download as .csv and use read.csv() instead of read.xlsx() in the code. To leave a comment for the author, please follow the link and comment on their blog: plausibel.